With advances in computing power and the steadily dropping prices of digital video technology, filmmaking has become a much more accessible art form in recent years. With a modest investment of a few thousand dollars, aspiring Steven Spielbergs can get their hands on a digital video camera to shoot their film, as well as a computer to edit and add digital effects to their raw footage. With such reduced barriers to entry, it is not surprising that one can find hundreds of digital video productions for download off the Internet, at sites such as MediaTrip.com and iFilm.com. And the popularity of digital filmmaking will only grow with this week's announcement of DVD-ROM burners as a core part of Apple's new Macintosh strategy. Of course, digital video production has not been limited to the creation of short films or special effects demos. A number of filmmakers have used digital video technology to create feature length films-- "The Blair Witch Project", the closely-related "The Last Broadcast", Mike Figgis' "Time Code", George Clooney's recent live-to-air remake of "Fail Safe", 1996's "You've Got Mail" precursor "Stuck", and even Robert Rodriguez's breakthrough "El Mariachi". "Surveillance", the directing debut of filmmaking duo Bradley Grossman and Debra Matlock that is about to make the festival rounds, is the latest addition to the digital video feature film roster. The framing device of "Surveillance" is a 'video letter' recorded by Los Angeles private eye Trip Stevens (comic Stephen Triplett, a regular on E! Entertainment's "Talk Soup"), spliced in with video footage derived from his most recent case. Grossman and Matlock do not hide their affection for film noir, and the use of this videotape, versus the traditional 'hard-boiled' voiceover narration native to the genre, is an interesting touch. As the 'video letter' plays, we see the events of the past few days, as recorded by the video cameras of Trip's own investigative team, as well as various surveillance cameras. The trouble begins when Trip is hired by the comely Kentuckian Junis Rozma (Jacqueline Carroll) to help locate her missing brother, C. Fred Owens (Michael Mewborne). Unfortunately, Trip manages to locate C. Fred, whose bullet-ridden body was found at the airport, and the missing persons case escalates into a murder investigation. To assist with the case, Trip brings in his own "Mission: Impossible" team-- surveillance expert Caz (former movie stuntman Caspar Poyck), special weapons expert Maxima (Tracy Talavera), and photographer Dava (Piper Henry, seen recently on TV's "Family Law"). Shot in a period of four months on a minimalist budget of $3000 US, the central conceit of "Surveillance" is that all the action is captured by 'natural' cameras, either the video cameras belonging to the characters, surveillance cameras in their vicinity, or footage previously-shot by others-- there are no 'narrative' cameras. Thus, there is no musical score either, unless it is a 'natural' part of the scene, such as from a car radio. 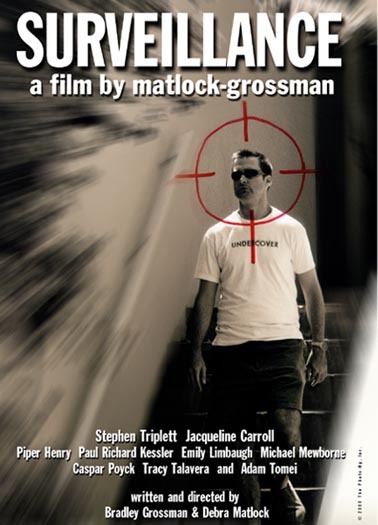 This is similar to the approach taken by Canadian indie "In Camera", which details a murder investigation at a prison and is told through the eyes of the prison's surveillance cameras. Thus, according to the filmmakers, the use of digital video in the production becomes more than a mere cost-cutting tactic-- it also becomes a thematic device. Unfortunately, this 'Dogme 95'-like conceit is stretched pretty thin by the demands of the story. Though Trip is an obvious 'tape-head', obsessively taping everything with several cameras set-up throughout his office and home, there are moments when the presence of a camera borders on the implausible. One scene has Trip being attacked by a couple of thugs, yet he still manages to hold on to his video camera and light-source, which the thugs don't seem to notice, as he is being beaten. Another scene involves a camera hidden inside a cardboard box that is being carried around by the bad guys-- oddly enough, the person carrying the box always has the 'camera side' pointing in the right direction. Also, it seems unlikely that Trip can splice in footage from surveillance cameras that are not under his control, yet he somehow he manages to (note that footage critical to the story is obtained by Trip through legitimate and illegitimate means). Having worked on some independent digital video features myself in the past, digital video filmmaking poses its own set of unique challenges, particularly when one is constrained by limited funds. In this respect, the problems found with "Surveillance" should be no surprise, but then again, it reinforces the cinema verité mise-en-scene of the production. The sound quality vacillates, and is particularly troublesome in the scenes shot in the character's cars or outside, where the ambient noise sometimes makes it difficult to hear the dialogue. There are also some lighting issues, particularly in the scenes shot at night, which is a shame, since these scenes offer the opportunity to add a genuine touch of film noir to the proceedings. Finally, when you are working on a low-budget film, you tend to be working with non-professional actors, and as a result, much of the action and dialogue you commit to tape is usually improvised. A high-level of improvisation is evident throughout much of "Surveillance", which doesn't always agree with the atmosphere the directors are trying to create for their film. Stephen Triplett is certainly a gifted comedian, yet his easy-going style doesn't mesh well with the supposed serious subject matter of the story, especially since he is supposed to carry the story as the 'hard-boiled' hero. The same could be said for supporting players Tracy Talavera and Caspar Poyck. Thankfully, Piper Henry, who bears a passing resemblance to Tea Leoni, fares better as Trip's irreverent yet charming photography expert, and it's a shame she didn't have a bigger role. However, the most interesting performance would have to be that of Jacqueline Carroll as the film's resident femme fatale. For the first half of the film, her performance actually comes across as rather stilted. However, a revelation made in the film's final act sheds a different perspective on the matter, and perhaps the 'performance' appeared doubtful for a very good reason. Images courtesy of Planet Fez Productions. All rights reserved.